Both of these cookbooks took me out of Chicago on a magnificent journey with their photographs (visuals are the key) and their timeless ethnic techniques. They reminded me why I love to cook and travel. They go together don’t they? Food and Travel. I rarely think of one without the other anymore even if it’s just a trip to downtown Chicago. So what’s the mark of a good cookbook? Makes you either want to get in your kitchen and instantly start chopping or hop the next flight to Greece or Morocco and pop in on a local restaurant or street food cart. There is little distance between you and the rest of the world when you take a trip inside a cookbook. From one of my favorite cookbook authors, Tessa Kiros's, Food from Many Greek Kitchens is the follow-up to her best-selling Venezia and Falling Cloudberries. 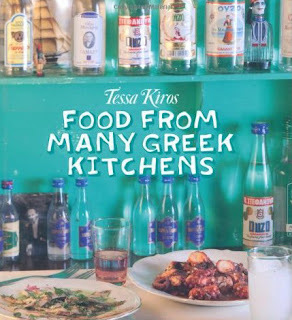 The book is brilliantly photographed and is filled with classic recipes such as my all time Greek favorite Saganaki. Her introductions make you want to try everything. Here is what she has to say about Vassilopitta: "In Greece, everyone has a vassilopitta (cake) at New Year. The wonderful thing about this cake is that a flouri (coin) is added before baking. If you're lucky to get the piece with the coin, you'll be blessed for the year. Much like the King cake in New Orleans, the Greek’s have a wonderful sense of celebration. The BEST part: You’ll get so engaged in the photographs, you’ll want to book yourself on the next flight to Athens. Mourad Lahlou is one of my favorite chefs. He came to San Francisco by way of Morocco and works miracles with traditional Moroccan recipes by putting his own twist and reworking them. The result: a new Moroccan that is my latest favorite addiction. 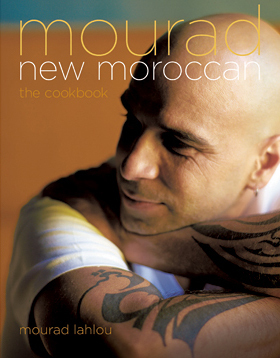 “Mourad: New Moroccan”, is a personal, unconventional masterpiece that springs from his mother and grandfather, who raised him in Morocco. His mother taught him to cook time-honored dishes and his grandfather took him to the local markets. I want a grandfather like that. Having grown up without one, I can appreciate the impression that the local markets must have left on Mourad. Even now when I go to the markets every Saturday in season, I am taken back by the strong influence of the local farmer. With a PBS TV series, this cookbook, an "Iron Chef" victory and a Michelin star under his belt, many cooks I know are experimenting with his recipes. Again the photographs of the Morocco I remember are absolutely stunning and will definitely make you want to learn (or relearn) how to prepare Moroccan food.